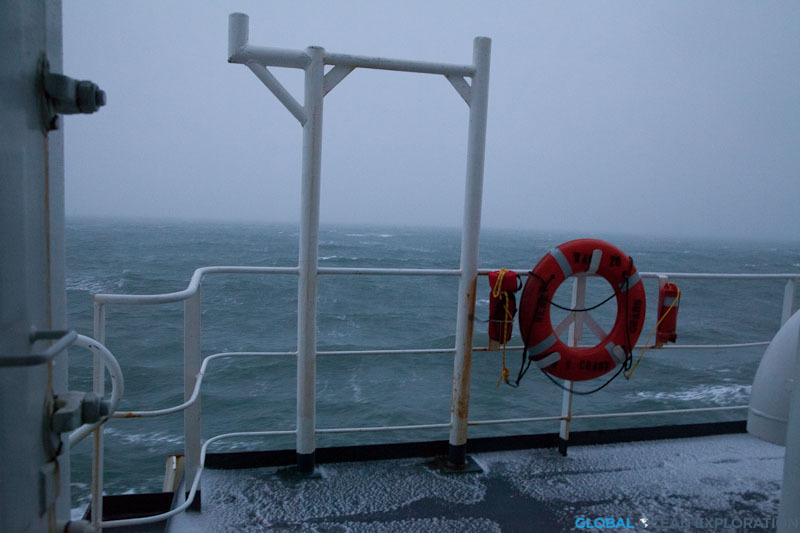 October 23rd was another rough day up here in the Arctic Ocean with high winds and big swells making operations difficult. It also marked the end of the scientific mission as it was time to begin our transit back to Dutch Harbor. The transit to Dutch will take about four days of steaming west through the Chukchi Sea, south through the Bering Strait and then south through the Bering Sea to Dutch Harbor. We are hoping for some calmer seas, but it looks like storms are in the forecast. Sure enough on October 24th, I woke up to everything in my cabin sliding around and the momentary fear that I had not secured all of my cameras and equipment. Knowing that the seas were going to build, I had put everything away but when those big rollers hit, flashes of flying cameras and computers went through my mind. 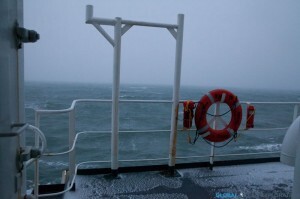 In the morning, we saw 50 Knot winds and 15-18 foot swells. With all decks secured, I was forced to watch the power of Mother Nature from the bridge and aft control room. It was intense with water sloshing over the fantail and up to the first deck of the boat. 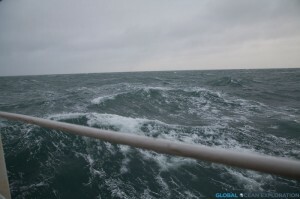 Throughout the day, the seas and winds calmed a bit and hovered around 25 knots as we approached the Bering Strait in the evening. We passed back south of the Arctic Circle and will enter the Bering Sea during the night. This entry was posted in Arctic, Climate Change, Ocean Acidification and tagged Bering Sea, chukchi sea, rough seas on October 26, 2011 by Gaelin.